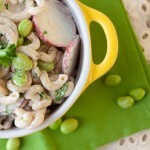 Spring inspired gluten-free, vegan pasta salad with lemon cream dressing, radishes, artichokes, shallots and edamame. 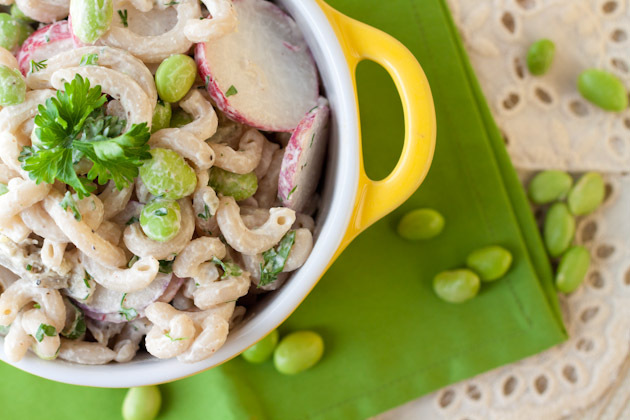 Prepare pasta, edamame, and artichokes stuffed with garlic cloves. While everything is cooking, chop shallot and radishes. Set aside. To prepare cream dressing, blend water, cashews, lemon juice, mayo, mustard and garlic until mixed. Adjust lemon juice to taste. I liked it at the 1/3 cup mark and the dressing slightly thicker. If you want to thin the dressing out, you can add 1-2 tablespoon of extra water. Pour blended sauce into a mason jar and add parsley, green onion, dill, zest, salt and pepper. Place in the fridge until ready to use. Combine all ingredients together and mix well until pasta is coated. Serve immediately. Rice pasta hardens when it’s in the fridge. If you’re taking this salad for leftovers, allow to sit on the counter for approximately 30 minutes to soften up.